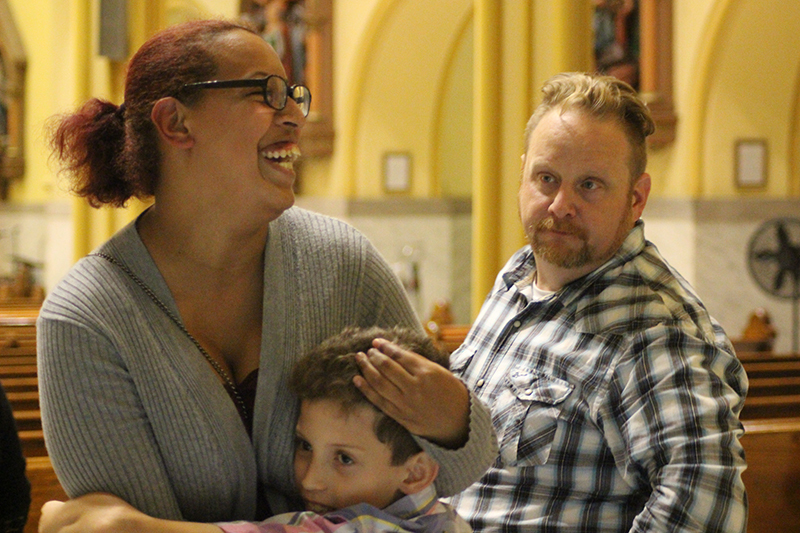 At a parish in Philadelphia’s Grays Ferry section, a patron saint’s feast — and a broken angel statue — became signs of healing for a church wounded by the ongoing clerical abuse scandal. More than 100 parishioners gathered at St. Gabriel’s Church on Sept. 28 for a vigil Mass in honor of the archangels Michael, Gabriel and Raphael. The three saints, each referenced in Scripture, are respectively associated with divine protection, good news and healing. “Gabriel is a particularly important patron now, because there’s so much bad news,” said Father Carl Braschoss, a Norbertine priest who was recently appointed pastor of the parish. In his homily, Father Braschoss noted that moments of darkness and conflict, when faced honestly, can serve as opportunities for experiencing God’s profound grace. “Even the smallest of these can be a gift through which we learn to work together,” he said. A newly installed statue of the angel Gabriel reinforced the evening’s theme of resurrection and renewal. Discarded for some 15 years, the figure — covered in Christmas-themed fabric — was rediscovered this summer by Father Braschoss in the boiler room of the convent basement. 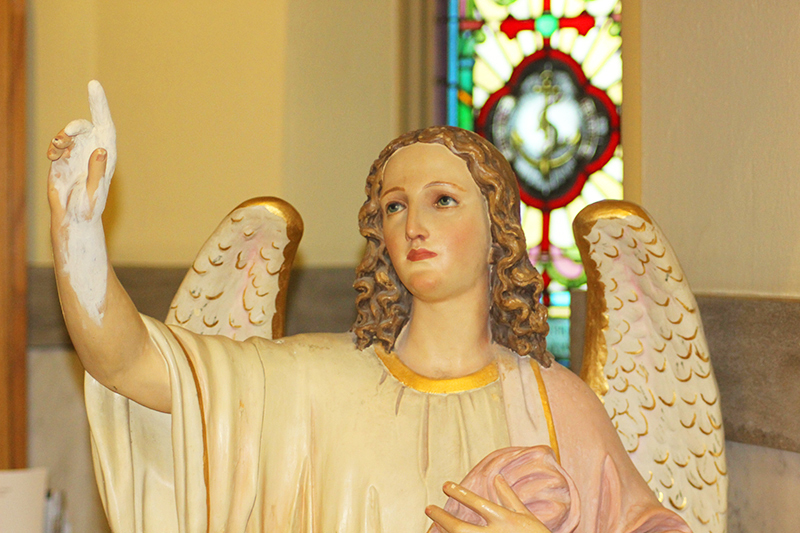 The angel’s right arm, which was missing from the statue, was later found in a separate box. Although damaged, the limb was reattached, rendering the figure an image of scarred beauty. The statue was placed in the church’s “welcoming cove,” an area near the entrance that contains information about parish life, sacraments and spirituality. Father Douglas McKay, who concelebrated the Sept. 28 Mass, pointed out that the cove once held the church’s baptismal font. As the founder of Our House Ministries, a recovery outreach adjacent to the church, Father McKay has spent over 40 years working to address the neighborhood’s longstanding battle with addiction. In a post-communion reflection at the Mass, Father McKay said that the angels provided constant guidance and inspiration for his ministry. “They’re all around us, and they love us,” he said. Unlike the church’s other statues, the reclaimed figure of Gabriel has intentionally been placed on the floor, rather than mounted to one of the walls. “St. Gabriel is on our level, accessible to us,” said Sister Adams. That same spirit of accessibility drew parishioner Rashidah Anderson and her family to St. Gabriel’s. A former Pentecostal Christian, Anderson attended an evangelization event after spotting a banner on the church fence. 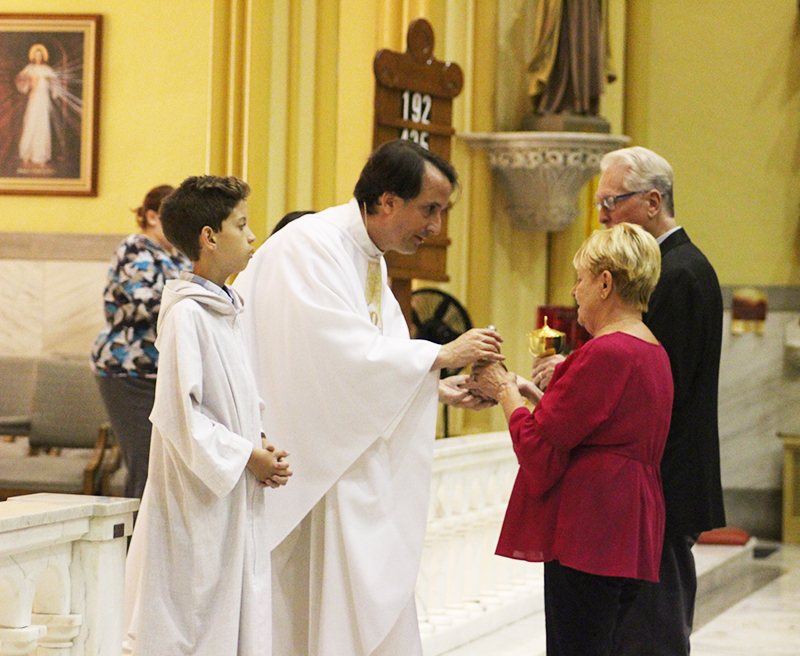 The warm welcome she experienced “cemented” her decision to join the parish. Anderson was received into the Catholic Church in April 2017 during the parish’s Easter vigil. Her son Aidan, now 11, made his first holy Communion that same evening. A regular altar server who assisted at the Sept. 28 Mass, Aidan is discerning a vocation to the priesthood, and has already memorized the order of the Mass. Father Braschoss — who often sits on the church steps to invite passersby to Saturday confessions — agrees.